The Fight for Metal, the debut album from Swiss traditional metallers Battalion, is a no-frills example of what made heavy metal the most powerful genre of music in the modern age. Formed in Zürich in 2001 under the name Corpus Delicti, the band released a short demo before changing bass players - and their name. Two years later and their full-length debut hits the streets thanks to Swiss label Quam Libet Records. While judging an album by its cover is never recommended, in the case of The Fight for Metal first impressions are dead on. Paul Raymond Gregory of Studio 54 has obviously been inspired by the album covers of the early '80s metal scene and has created a fine piece of artwork that captures the essence of not only the album, but the band as well. Moving on to the the album title, as well as song titles such as "Headbangers" and "Gods of Metal", you're left with little doubt as to what will leap forth from your speakers as you insert this disc. As long as you understand what you're in for, and are a fan (like me) of the Golden Age of metal, then The Fight for Metal is an album you must definitely give a try. The title track sets the tone of the album, opening with a frantic solo from Silvan Etzensperger. Silvan also handles the vocals, possessing a steady mid-range voice with a slightly throaty quality that works well to impart the "pump your fist" aggression given off by the music. He stays well below the upper ranges, remaining firmly in his comfort zone. While not an outstanding singer, he does an admirable job and fits well with the overall mood and atmosphere. My favorite track on the album, "Headbangers", is a delightfully simple track that does what it's designed to do - get your head banging. The chugging, meaty riffs from Silvan and brother Cyril are given a powerful deep-end from bass player Dejan Terzic. Add a memorable sing-a-long chorus and it's hard not to get involved in this track. Taking a page from Iron Maiden's book of historical epics, "Stalingrad" is an ambitious track focused on that fateful campaign of World War II. Silvan and Cyril broker a twin-guitar attack with adept time changes and fairly complex riffs, while drummer Samuel Riedener keeps time admirably. Silvan adds a little more grit to his voice for this track while serving up several melodic solos as the song makes its way through a nearly eight minute course. Included in the track is a spoken-word interlude, from a German soldier's point of view, that sounds quite like Maiden's "Rime of the Ancient Mariner" (without the German lyrics, of course). Another highlight is the bonus track, a reworked version of "Headbangers". Musically identical to the original, the vocals are instead handled by Cyril who delivers with a definite Death metal growl that makes for an interesting listen. The one point where Battalion fails to deliver is the ballad "Through the Night". Silvan is obviously uncomfortable on this track, and comes off as sounding forced and a bit awkward. Musically the track is fine, but still comes across as painfully out of place with the rest of the album. 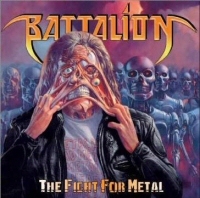 Strongly influenced by bands like Saxon, Judas Priest, Iron Maiden, and early Scorpions, Battalion have crafted a collection of blistering leads, galloping riffs, catchy choruses, and gritty vocals. Fans of classic metal absolutely should give The Fight for Metal a listen.